Anyone reading this who’s been a reader for any length of time will know that I love to bake, and more specifically, to experiment and have fun with all kinds of fun recipes. From recent recipes like S’mores Cheesecake and Zebra Bundt Cake, to older but still fun recipes like Pretzel Coated Chocolate Cookies and Cream Cheese Swirled Chocolate Fudge Cake, I try to share fun and unique recipes with you folks. But sometimes I like to share some more basic recipes. Things like Chewy Chocolate Chip Cookies and Blueberry Muffins may not be unique or different, but I definitely think they are recipes worth sharing. Today’s recipe is more along the lines of the basic, staple type recipes. It’s not revolutionary, but it sure is delicious. Next time you want a simple drop cookie that isn’t the typical chocolate chip, try switching things up a bit by reversing things. Chocolate cookie, white chips. They’re as delicious as they are pretty. Bonus: if you’re not a fan of white chocolate, just add chocolate chips instead. 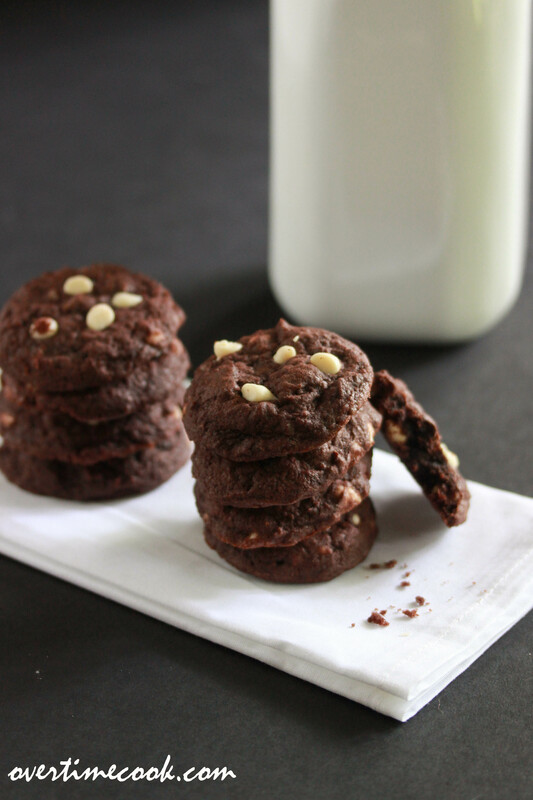 No sane person can say no to double chocolate cookies, right? Preheat oven to 375. Grease cookie sheets lightly or line with parchment paper and set aside. In the bowl of an electric mixer, cream together the butter or margarine, sugar and brown sugar until smooth and creamy. Add the vanilla and eggs, beating well to combine after each addition. In a separate bowl, whisk together the flour, cocoa powder and baking soda. With the mixer at a low speed, gradually add the flour mixture and stir until just combined. Stir in the white chocolate chips. Using a medium cookie scoop (or a heaping tablespoon measuring spoon) drop the dough onto the prepared sheets, leaving about 2 inches in between the cookies for spreading. If you would like to make them look prettier, press an extra 2 or 3 white chocolate chips onto the top of the cookie. Bake the cookies at 375 for about 9 minutes, until set. Remove from oven and let cool. Hope you like these cookies folks! Thanks for visiting! -Miriam PS- I am working on Yom Tov recipes now- anything specific you want to see? Hey! 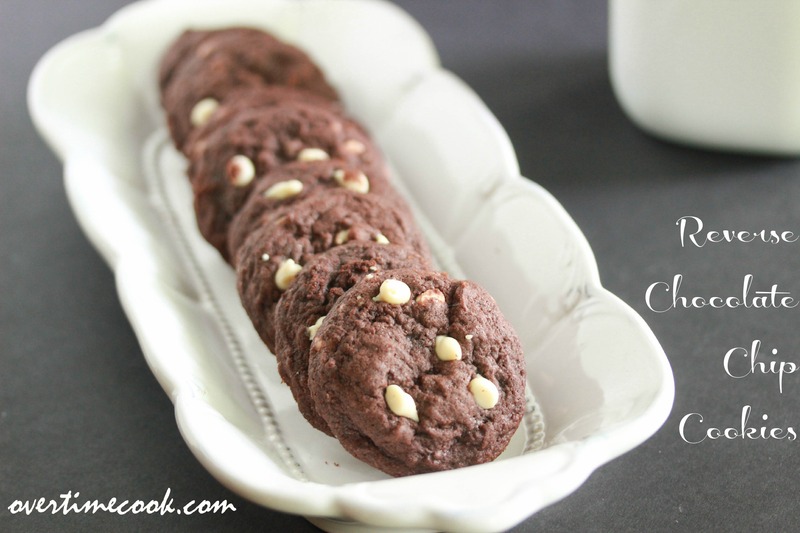 These cookies are one of my favorite recipes! I love how they look on a plate with regular choc chip cookies. Did you get this one from Dining In? 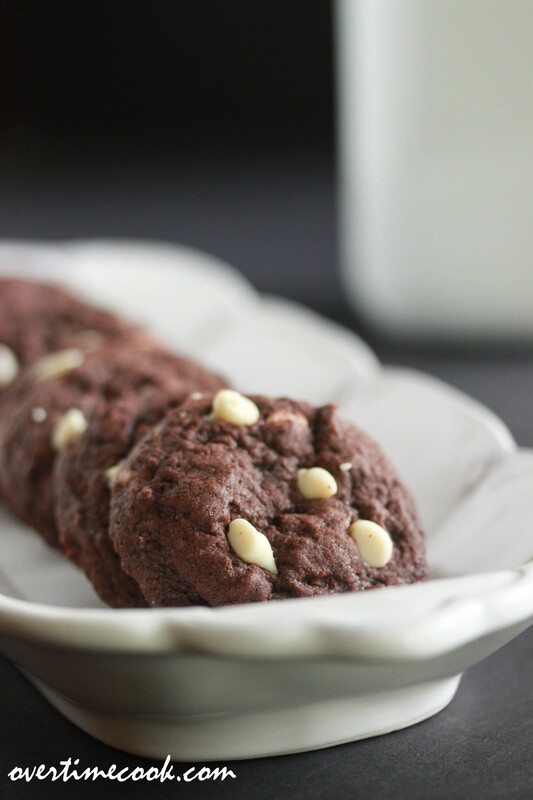 This recipe is my personal spin the the basic cookie recipe I always use. I’m not familiar with the Dining In recipe, but it is likely pretty similar to this. As I mentioned in the post, this is a pretty basic and well known cookie. Staple recipes are always a favourite, not to mention delicious comfort food too! Yum I love white chocolate chips! Wow, good idea! They look so cute! Made me think of the inside out chocolate chip cookie dough truffles…. For Yom Tov, I would like to see make ahead or quick, somewhat kid friendly dinners for after tiring chol hamoed excursions. will they come out good with oil? CaN these be made with oil? What would the conversion measurements be to oil? I’ve never tried it with oil. You can make it with 1/2 c. oil instead of 1 cup of margarine. They came out amazing! Perfect consistency and great taste!